A must-have for the busy chef, this versatile All-Clad Stainless Dutch oven can go from stovetop to oven before becoming a beautiful serving dish at your table. Perfect for slow-cooking a wide variety of meats, vegetables and stews, it features All-Clad’s superior tri-medal bonding process. 18/10 stainless interior, pure aluminum core and polished, stainless-steel exterior ensure an even distribution of heat and uniform cooking. 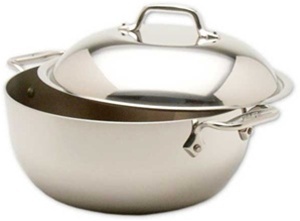 10 1/2 x 4" Stainless 3-PLY Bonded Construction Dutch Oven. Holds up to 5 1/2 quarts.